My second trip to the state of Hawaii occurred almost exactly a decade after my first. Vivid memories still spring to mind when I think back to my middle-school self, attempting to grasp onto a giant sea turtle while snorkeling on the big island (protected species - do not attempt). 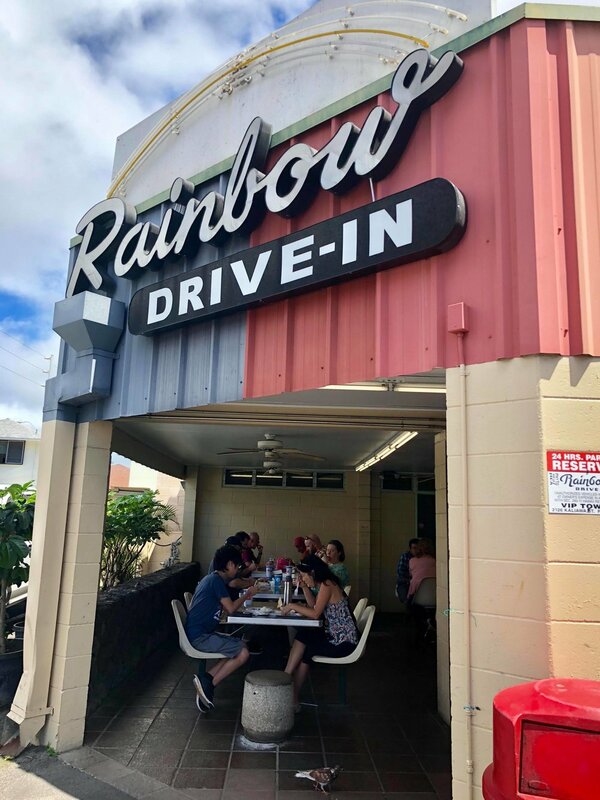 Aside from the cities of Europe, Hawaii's largest city probably offers more gastronomic delights per square mile than most other destinations. 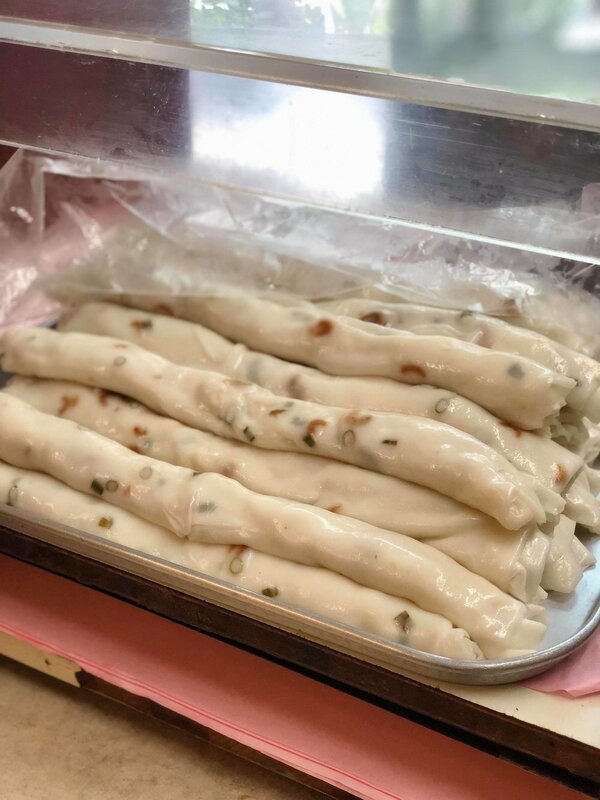 Asian migrants have long journeyed to these pacific isles, so Chinese and Japanese and other ethnic flavors are integrated into the cuisine here. Specifically, there is some excellent Japanese fare on these islands (and lots of Japanese signage! ), both a reaction to and a result of the large amounts of tourists that originate from the country. 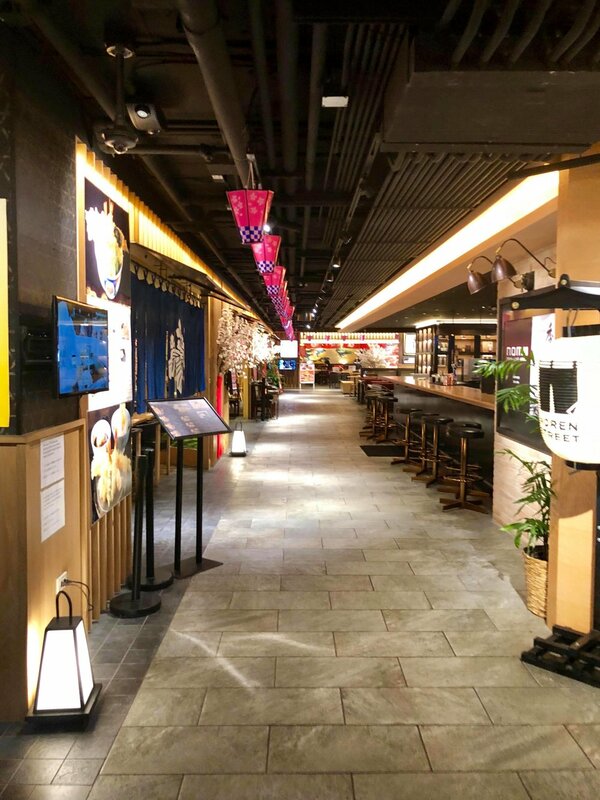 So let's begin with my gastronomic adventures the night of arrival - we stopped at Yokocho Gourmet Alley, a recent addition to the Waikiki area, featuring a variety of Japanese eateries in an underground, food stall setting. An adorable Musubi (rice ball) store in the center of the alley. Shichimusubi features organic rice and the traditional selection of musubis, including salmon, pickled plum, and the Hawaii special - spam. Ramen time: Bario served up large, scrumptious bowls of steaming noodles, including tsukemen (dipping noodles) seen below. If you're more of a traditionalist, there's always a standard bowl of the restaurant's succulent, slurp-worthy ramen. Last but not least, stop by Nana's Green Tea for dessert. Their sweet, supple matcha soft serve swirl is mesmerizing on a waffle cone, or if you're in the mood for something slightly chewy, opt for anmitsu - a Japanese classic featuring mocha, red bean paste, and ice cream on a bed of agar jelly (right). 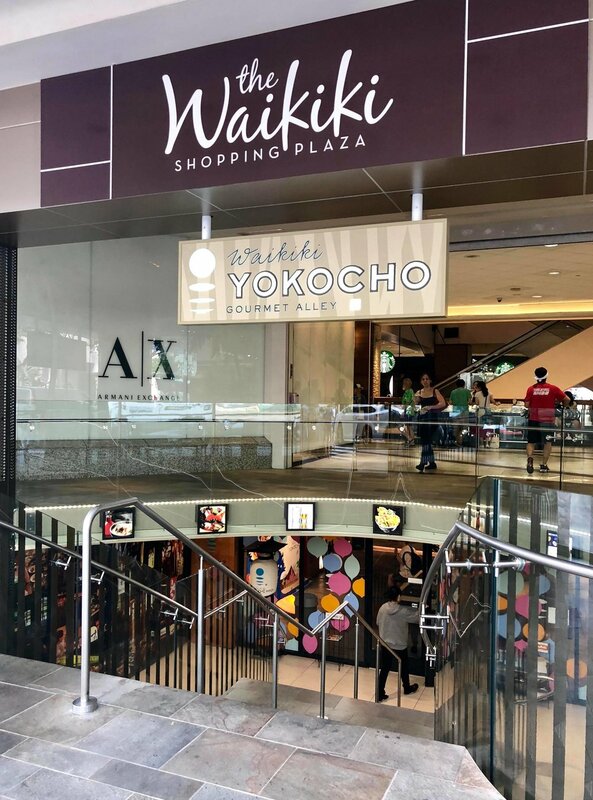 Yokocho Gourmet Alley is located in the bottom of Waikiki Shopping Plaza, which is in the heart of the Waikiki shopping area - also known as Waikiki beach walk. This avenue will very likely meet all of your shopping needs. Unless you're looking to purchase a pony in Hawaii. Maybe. 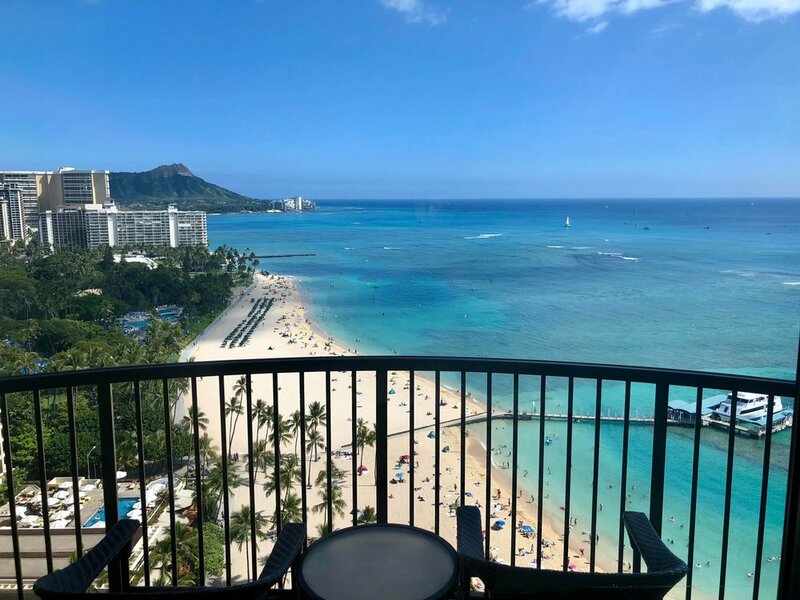 If retail therapy isn't what your looking for, opt for a post-dinner stroll towards Waikiki beach instead. 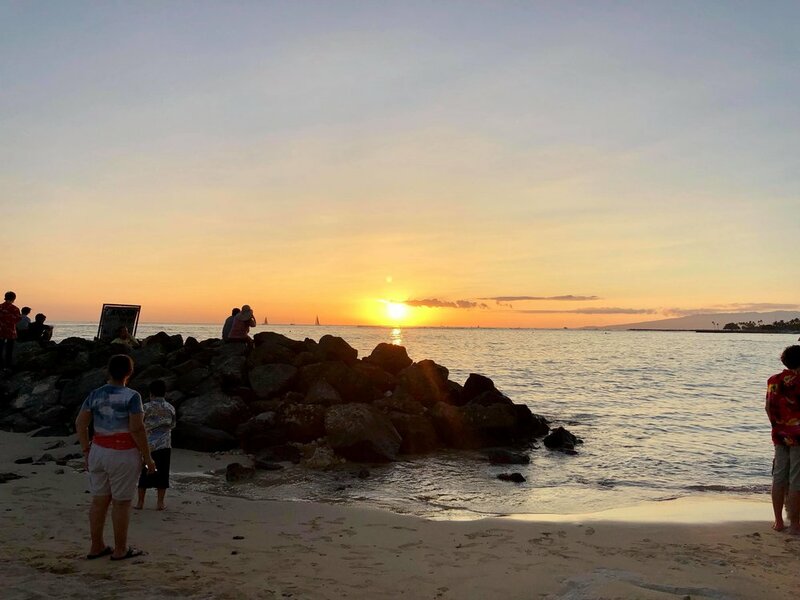 Speaking of which, the sunset seen from the Fort DeRussy Boardwalk along the sandy shores is a great place to see the sunset. And as with most sunsets, before you know it, night has fallen - and thus ends my first day after a decade in Honolulu. Day 2 began with me looking out over the balcony, and seeing what appeared to be a small beached whale on the beach. Alas, it was not. But naturally I grab the brother anyways and we head off towards the gathered crowd. 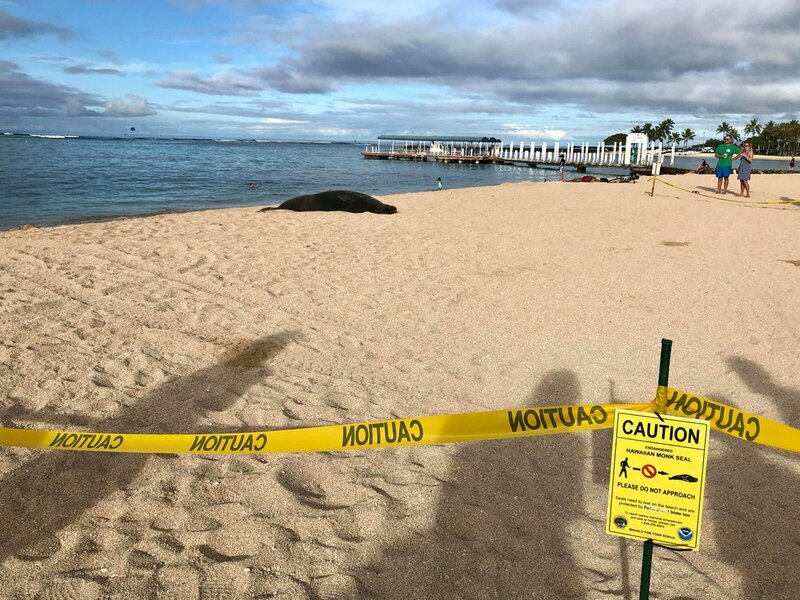 It's a seal! 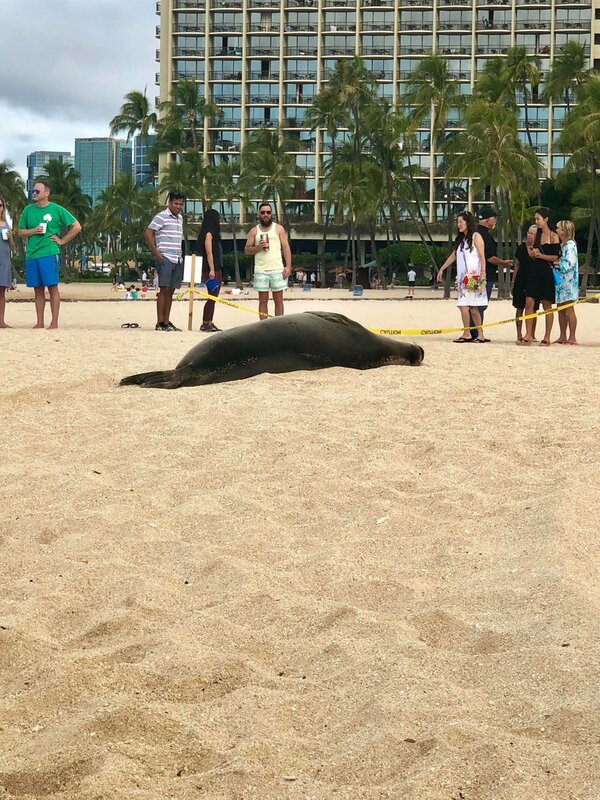 Apparently uninjured, and casually sunbathing on the beach, it seems. 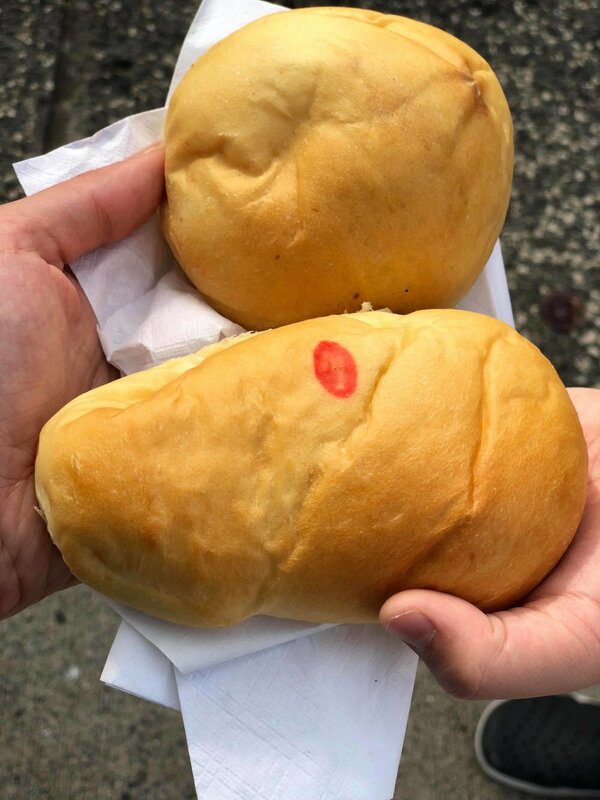 For breakfast, stop by Royal Kitchen in Chinatown for a manapua - essentially the Hawaiian version of a char-siu bao. You can get them with various fillings, see below for char-siu (left) and portugese sausage (right). A rice noodle factory run by no one under 65 tucked away in one of the buildings of Honolulu's historical Chinatown. Although I enjoy my fair-share of rice noodles - I've never actually seen how it's made. Turns out, each layer of the fold is made on a separate metal pan, cooled, condensed, and then rolled together with other ingredients between the layers. Two popular dessert stops in the city I'm going to recommend: first up, Liliha Bakery for their famed coco-puffs. 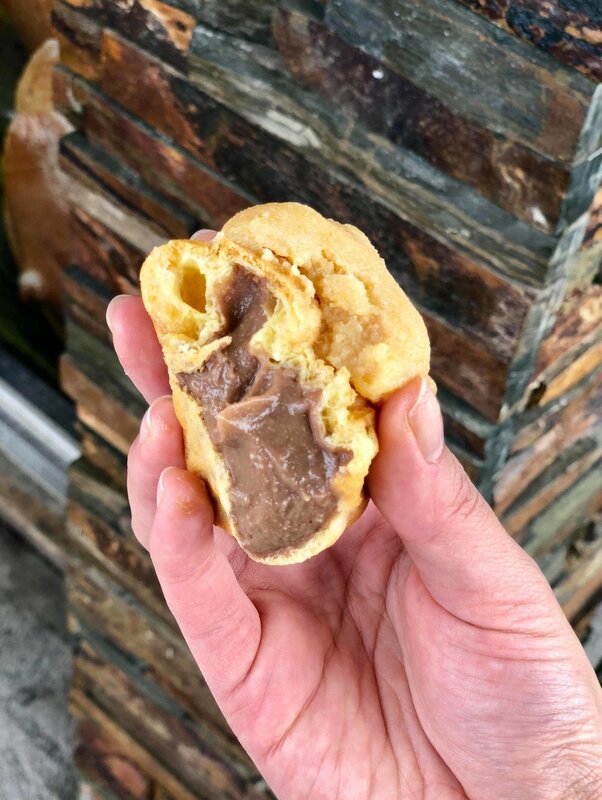 This pillowy dessert puff lives up to the hype. The creamy interior balances well with the airy shell, and the coconut / chocolate aroma of the cream is thick but light. Refreshing, decadent, but not heavy. Worth at stop at any one of Liliha's locations to pick up a few (or a dozen). Verdict? Quite good, though I preferred the coco puffs from Liliha myself. 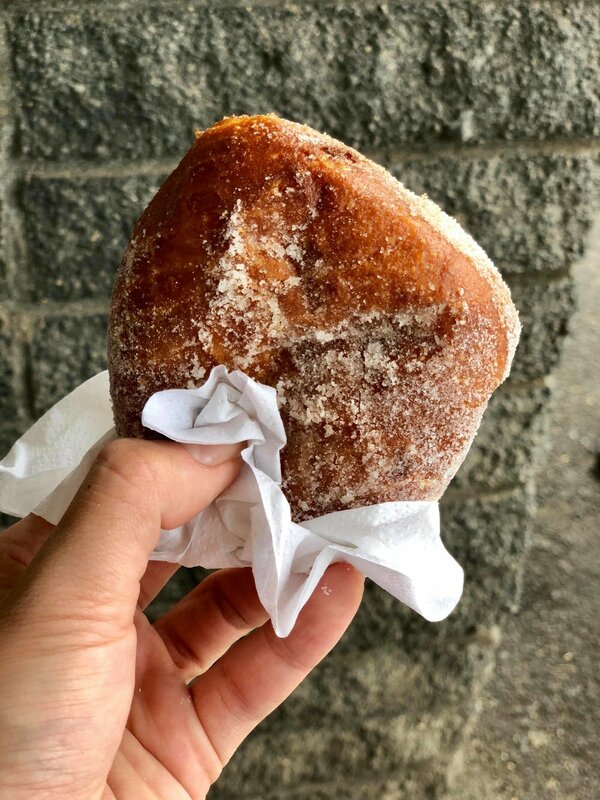 Solid, sugar dusted fried dough with an airy interior and a burst of umami goodness. Now, for an all-time favorite. 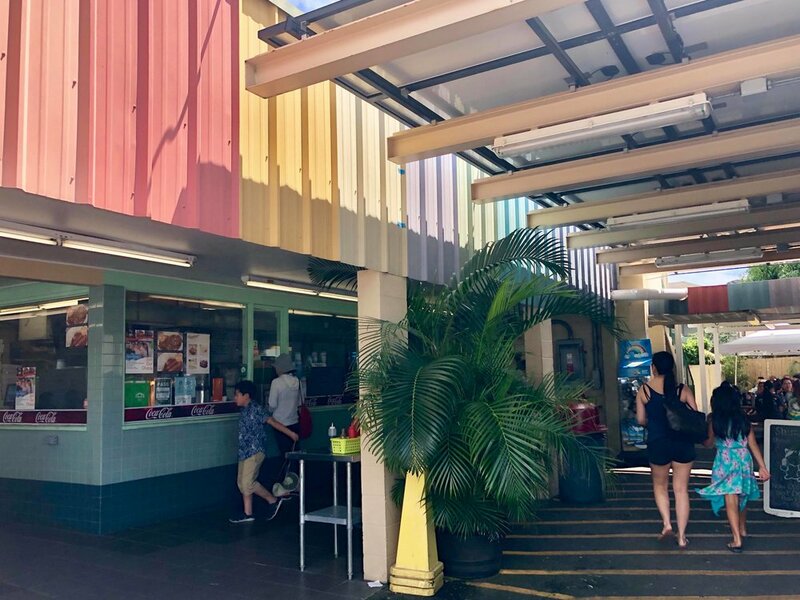 The classic loco-moco (left) at Rainbow Drive-In, an institution among locals. Invented to serve famished surfers along Hawaii's endless shorelines, loco-mocos typically feature two scoops of rice, one scoop of macaroni salad, a beef patty, gravy, all topped with 1-2 fried eggs. Two things: one, I shouldn't have to tell you this is good. What about it's myriad ingredients could possibly be bad (except maybe the fat content)? Second, bring an appetite and still, split one to share. This monstrosity of a plate is not for the faint of heart. Literally. Right, Rainbow's mix plate, featuring BBQ beef, fish of the day, and boneless chicken, accompanied by the usual two scoops of rice and one scoop macaroni salad, with tartar sauce on the side. 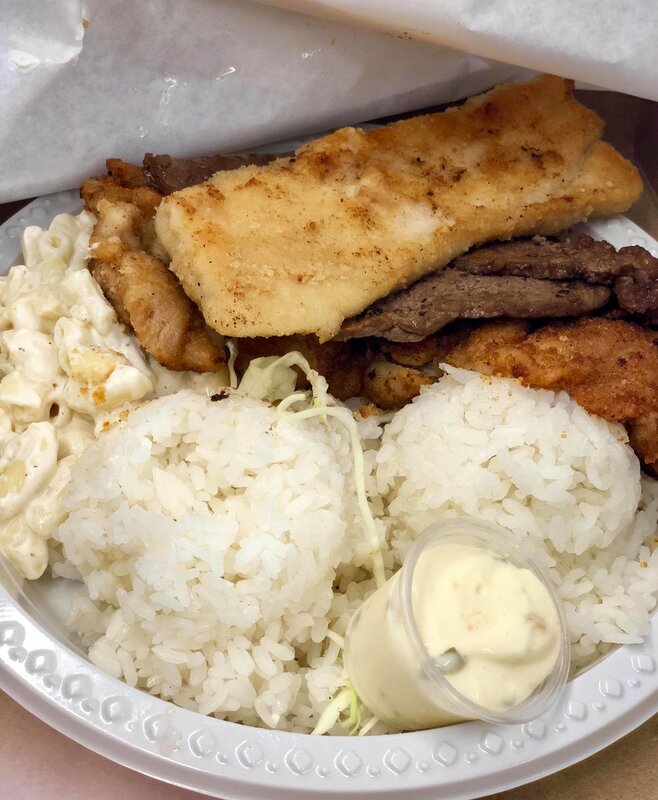 Mix plates are the multifaceted variant of Hawaii's traditional plate lunch, an idiosyncratic of local fare that describes any meal featuring scoops of rice, macaroni salad, and an entree. And because all my decisions are so well-thought out and days so terribly well-planned, after this half day of eating - it was time for the beach. 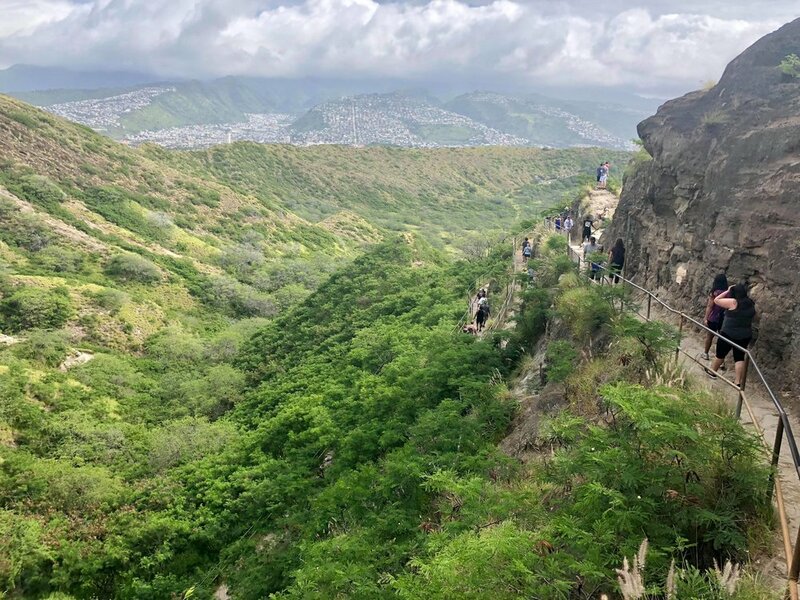 Day 3 began with a climb up iconic Diamond Head. The hike itself is about 40 minutes each way, not overly difficult though the trail can get narrow at times. 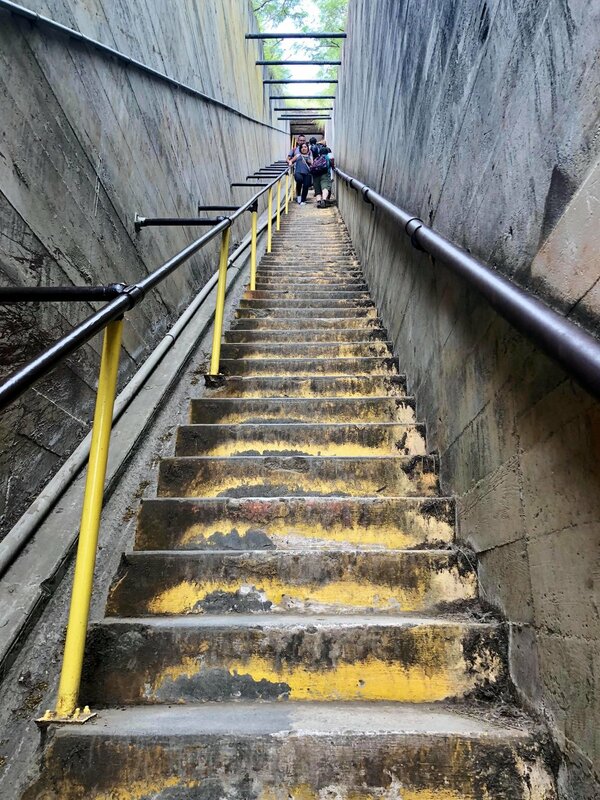 Lots of stairs (and people); definitely bring your water bottle. On the summit one of many viewing decks await - and hikers are rewarded with a panoramic view of Waikiki. Left, the famed 'stairway to heaven' that serves as a short-cut to the panoramic viewing platform at the very top of the mountain. Beware that after the steep climb, one has to exit out of a bunker, seen below right. Customers walk into the store and are greeted with the sight of udon-making. Delicate, chewy strands are hand-made and hand-pulled daily, prepared upon ordering. Marukame Udon is the franchise's first location outside of Japan - choosing the city of Honolulu for its relative proximity to the mainland and its sizeable population of Japanese. 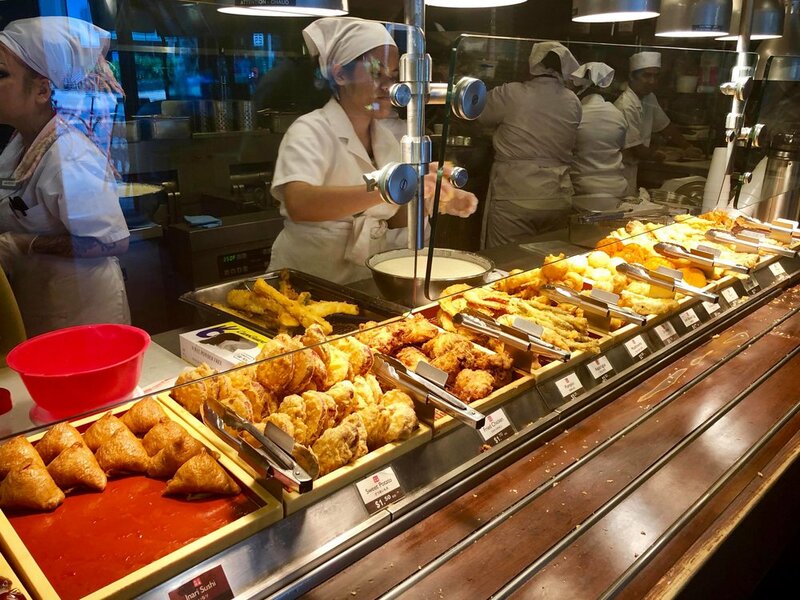 It is, however, one of the most popular places to eat amongst tourists - so expect long lines at lunch and dinner hours throughout the week. The food here is served cafeteria style, with the bowls of noodle made-to-order, and a selection of tempura (below) to pair with the udon lined up right before the checkout counter. Some of my favorites: the delicately sweet Okinawan yam, the ubiquitous shrimp tempura, and the crunchy vegetable tempura - which consists of a mass of onion shreds fried to perfection. They also have hand-made inari here (rice wrapped in sweet tofu skin, left) - one of my favorites. Seen below, the Niku (Sweet Beef) Udon served with a soft boiled egg, hands down a winning combination of noodle perfection. Served with a dollop of grated daikon (radish), a sprinkling of fresh spring onions and tempura flakes, the soup embodies umami in combination with the runny egg yolk and juicy, succulent slices of beef. Simply perfection. Need a sweet treat after the udon goodness? Next door to Marukame is Matcha Maiko - a straight-outta-Japan joint that serves up endless combinations of green tea dessert. If you're a matcha aficionado like me, this place is definitely worth a try. Or two. Or three. Hey - who's judging? As a post-lunch snack, or really an anytime snack, spam musubis are native to Hawaii and a near perfect blend of rice, spam, and seaweed. 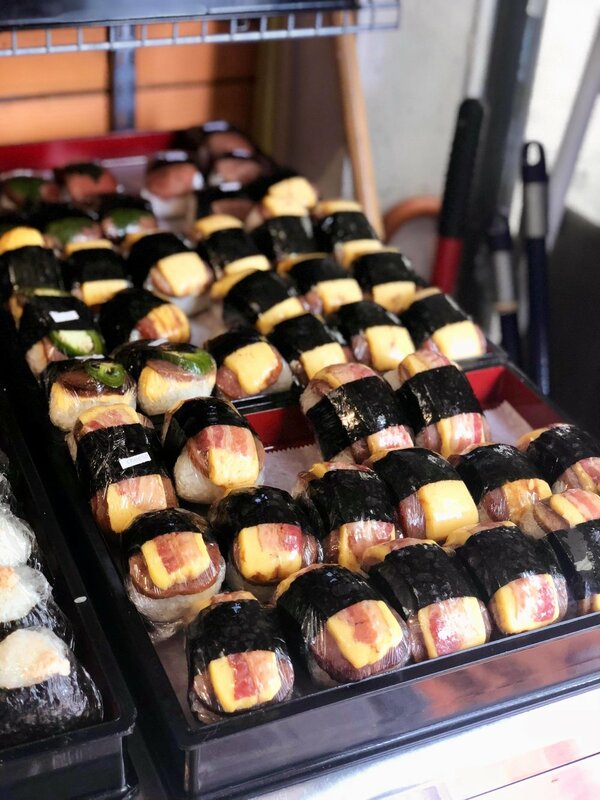 The chain store Musubi & Bento Iyasume has several locations in Honolulu and specially features a wide selection of spam musubi - from original (with only spam & seaweed, to toppings including avocado, tamago (egg), bacon, and jalapeno. Clockwise from below center, the original spam musubi, spam musubi with egg and bacon, with spam and shiso leaf, with spam and avocado, and finally, with spam and takuan (sweet preserved daikon radish), center.